Don't let the name fool you - Optionshouse isn't just all about options. Sure, the company was founded by one of the largest options-trading firms in the U.S. (PEAK6 Investments, LP), but the company has spared no expense in appealing to stock traders as well. Options traders will surely be drawn to this company, but stock traders will also find much to love as well. 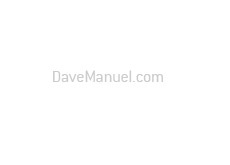 One of the greatest appeals of Optionshouse.com is their flat-rate commission model. Stock trades are a flat $2.95, options trades are $9.95, and flat-rate spreads are $14.95 (up to four legs). Many companies suffer from complex commission plans, but Optionshouse is clear and simple when it comes to their commission scheme. According to their web site, Optionshouse.com was voted #1 in "Trade Experience - Best For Options Traders" by Barrons.com. Barrons.com also gave the company a rating of 4 1/2 stars out of 5, according to their web site. The company's software package is outstanding - it's simplistic enough so that it is not overly complicated for a fairly new trader, but it also provides enough bells and whistles to satisfy the more advanced trader. Optionshouse was founded in 2005, and has since grown into one of the largest online options brokerages in the industry. 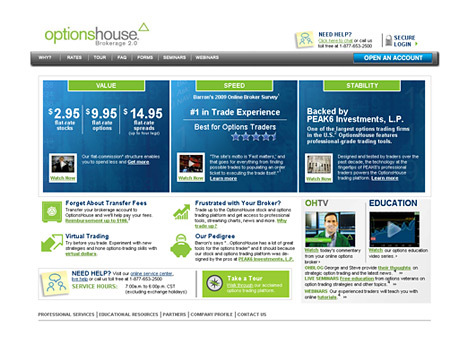 The company behind Optionshouse, PEAK6 Investments LP, was founded in 1997. PEAK6 Investments LP is headquartered on the "original CBOE trading floor". Optionshouse will reimburse you up to $100 for any fees incurred as a result of transferring your account from another brokerage to Optionshouse. 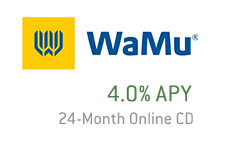 The company will also allow you to test their software using "virtual dollars" - this will allow you to decide whether or not you are comfortable with their software package before actually opening an account with them. Optionshouse is a well-reviewed company that has been able to substantially build their client base over the past four years.